Over the last few months I have spent a lot of time getting to grips with Instagram. 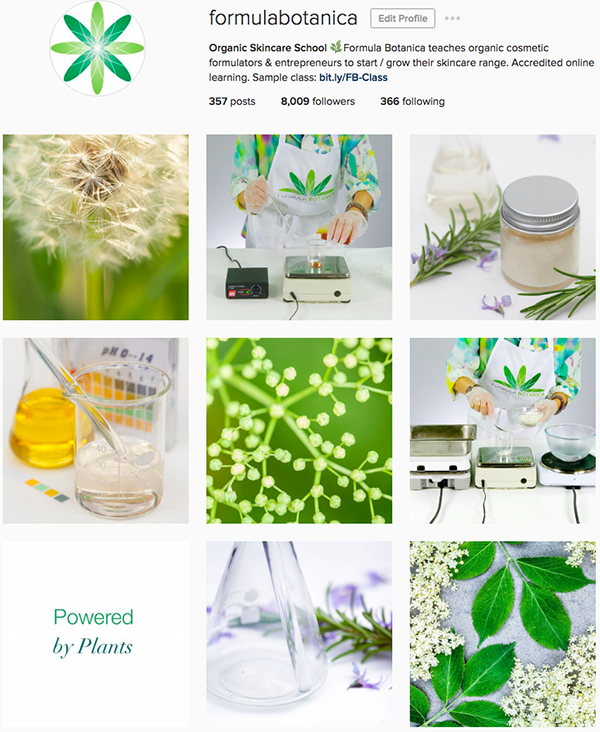 Formula Botanica now has over 8000 followers, many of whom are engaged and interested in what we have to say. We have gained those followers through hard work and good content. Figure out what your brand is. What is your logo? Is it visible when viewed on a tiny screen? Don’t just stick up a jar of lotion as your profile picture, make sure you have a memorable logo or photo of yourself which pops on the screen. You may want to remove all the text from your logo and just go with a small image if your larger logo does not lend itself well to a small box. What are your brand colours? 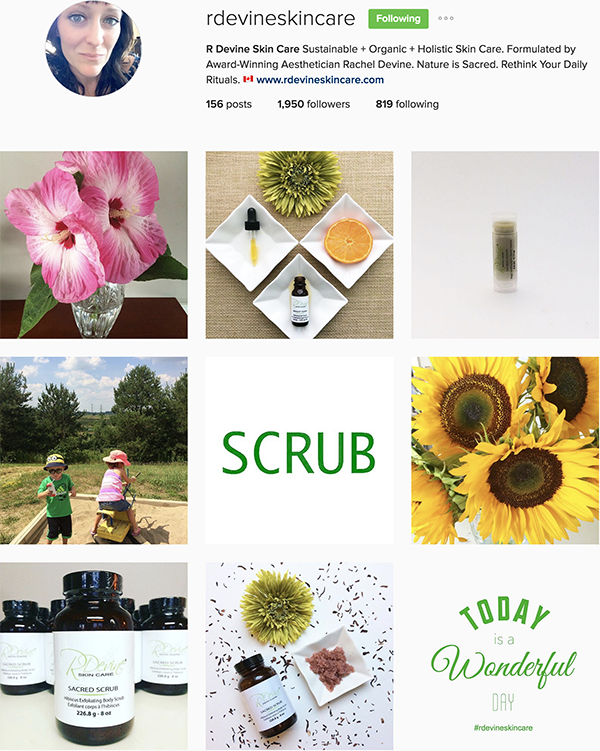 Try to get consistency in those colours – think of your skincare business Instagram profile as a small vision board which reflects your brand and your ethos (and your products!). 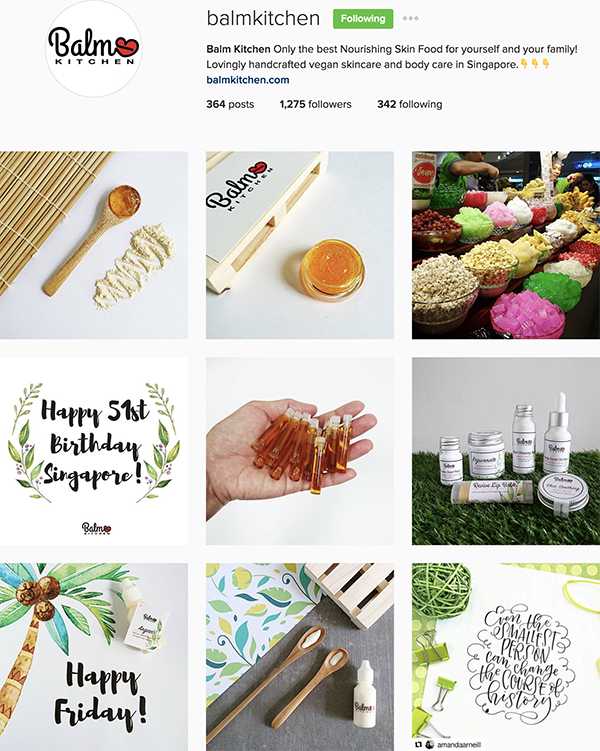 This Singapore-based natural skincare brand run by our Tutor Teresa Foo has a very strong brand. Teresa takes gorgeous photos of her products, her formulations and her creative ideas. Follow Balm Kitchen on Instagram to see more. You need hashtags, don’t hope to gain followers without them. You can only post a maximum of 30 hashtags on each photo, but you need to optimise those hashtags. Spend a lot of time researching the best hashtags for your brand and your target customer and then make a list of them in the notes app on your phone. Don’t choose hashtags that have millions of photos if you only have 50 followers – your photo will be lost in a sea of other photos (of dogs and dinners). Choose small niche hashtags and build it up slowly. When you have 1.2m followers, only then can you use the hashtag #love and manage to stand out. 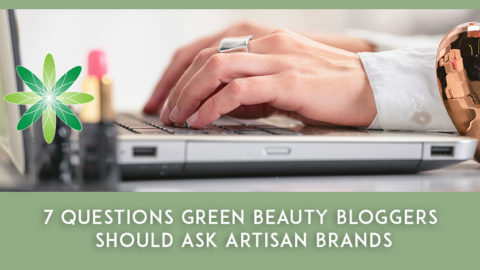 Before then, stick with hashtags with smaller numbers of followers such as #botanicalbeauty or #cleanbeauty. This Melbourne-based skincare brand, run by our graduate Anca, posts up stunning photos of its amazing natural beauty products and inspirational quotes. 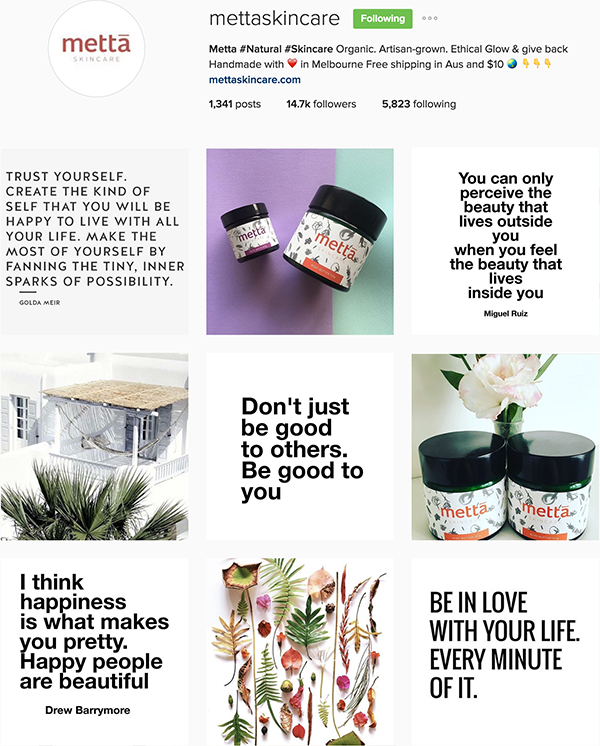 Metta Skincare also uses the right hashtags for the right photo, which has helped grow their followers to close to 15k. Follow Metta Skincare to see more. Please remember that your brand is about you and your products, it is not necessarily about your dogs, your dinners and your babies. You are trying to sell people a brand of skincare, not show them your pet labradoodle. You might think your dinner tasted great, but it is an unfortunate fact that many of the food photos on Instagram look like they’ve been regurgitated. If your brand is about people frolicking on the farm, then cute babies and pets may be on brand, but if you are trying to create a luxury premium brand then there’s very little space for cutesy family, pet and dinner photos. “Behind the scenes” photos are great, but they should be of you creating the brand and should allow your followers to connect with you as a brand owner. So go easy on the dog photos. 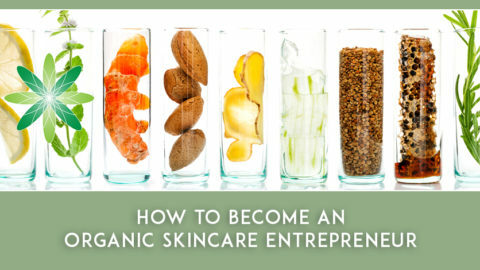 This Canadian skincare brand shows off their behind the scenes photos brilliantly, giving a glimpse into the life of the brand’s owner and founder, Rachel Devine (a great member of our Formula Botanica student community! ), while still showing clearly what the brand stands for. Follow R Devine Skincare to see more. Your photos need to be good. Don’t just point, snap and upload. Take the time to get your photos right. Those skincare business Instagram accounts with millions of followers and thousands of likes on each photo? They take the time to get it right. Make sure you have good lighting, good colours, good framing. Get the subject matter right. And please stop putting up garish advertisements – people don’t follow Instagram accounts to be shouted at about your discounts. We’re going to blow our own trumpet here! Formula Botanica has its own in-house photographer, Richard Cottle, who creates our beautiful botanical imagery for us. Follow Formula Botanica to see more. Think of Instagram as a magazine. Your followers want to see the overall lifestyle and message you’re selling. I use an app called UNUM which has been the making of our Instagram account. I upload photos in advance and shift them around in a grid to find the right composition for our Instagram page. It takes time, thought and effort to create a board that looks pretty. We now have a formula to how we post images and it works. This Sydney-based skincare brand run by our tutor Helen Dao has created a beautiful magazine which embodies exactly what they stand for. Her colours are fresh and modern and she knows exactly how to show her followers what her brand is about. Follow Be Fraiche Skincare to see more. Not all times of day are good for posting. I use an app called Insta Command which tells me which times of day have been more successful for engagement. I know that posting in the evenings isn’t good for us, so I don’t do it. I get my photo, text and hashtags ready the night before and then upload the image in the morning. It may be completely the opposite for you, depending on who follows you. Test out different times and see what works best. And hopefully you don’t have to fill the 6am slot, like I do! You sell skincare products, so you need to show them to your followers. But don’t use your skincare business Instagram account as a catalogue of products, instead show your users the lifestyle they will have when they buy your products. 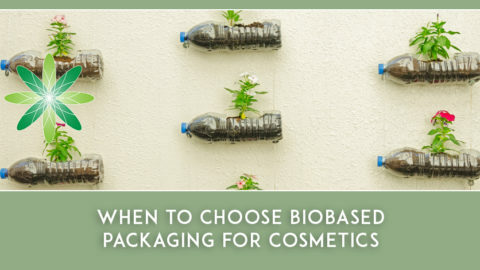 Make sure your products are actually featured on your page too – I’ve seen so many skincare companies who don’t put up enough images of their products. Don’t be shy about showing the world what you’re making and make sure you feature your products. 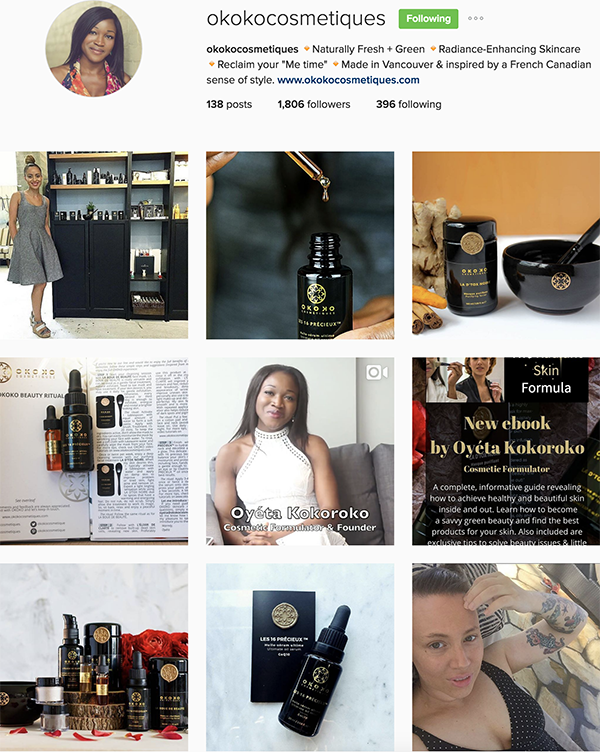 This Canadian green beauty brand, run by our graduate Oyeta, posts up regular beautiful photos of its own products, as well as sharing images from beauty bloggers and showing behind the scenes imagery. Follow Okoko Cosmetiques to see more. Beautiful photos are important, but you must also consider the text. What are you telling people about your photo? How are you benefiting your followers? I’ve been microblogging underneath our photos for the last couple of months and it’s been hugely successful. Don’t type your text straight into the Instagram app, make sure you construct a nice story in your notes app first and then turn it a beautifully structured story that you can copy and paste straight underneath your photo. The cosmetic ingredient shop run by our lecturer Elham shares little nuggets of information underneath each beautiful photo, giving you an opportunity to learn more about your beauty ingredients. Follow SkinChakra to see more. If you want to get into the top 9 photos for a hashtag that has 100,000 images, make sure you get at least 100 likes on your photo. If you want to get into the top 9 photos for a hashtag that has 1,000,000 images, make sure you get at least 1000 likes on your photo. There’s a formula to it and no doubt Instagram tweaks its algorithm continuously, so make sure you figure it out for your particular hashtags. 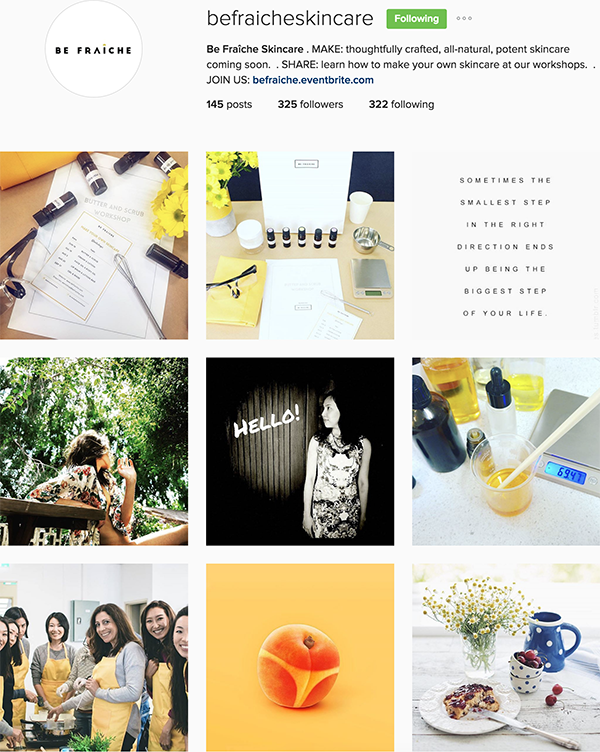 Growing your Instagram profile takes a lot of time and effort but the rewards are fantastic. Your followers will grow in numbers and become more engaged, you’ll see your business profile increase and you will see more sales. 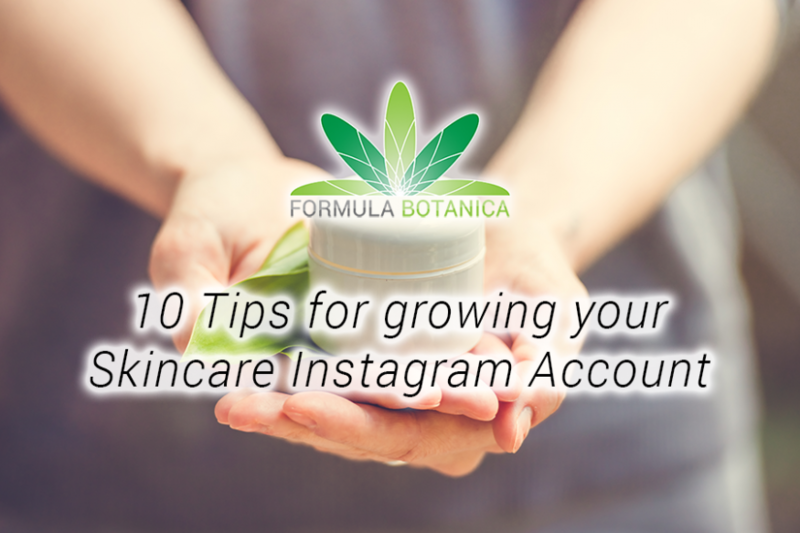 Follow Formula Botanica on Instagram for our organic cosmetic formulation tips. 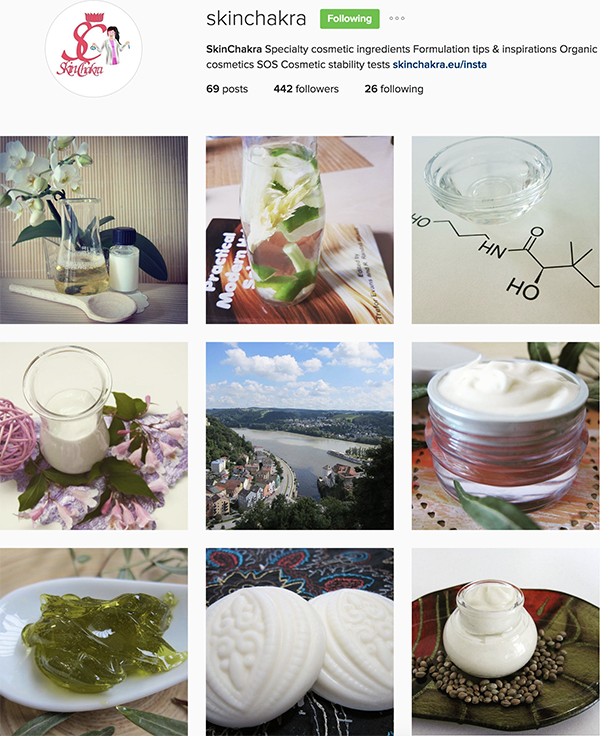 Want to show us your skincare business Instagram account? Leave us a comment below with your profile link! 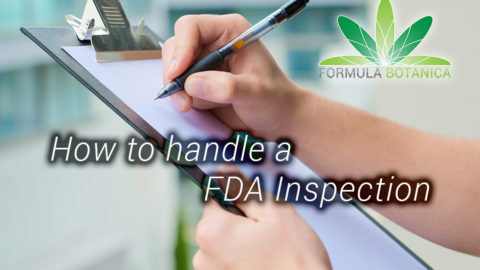 Today’s blog is by Lorraine Dallmeier, Director of Formula Botanica. Lorraine is a Biologist and loves using Instagram. Follow Lorraine on Twitter at @herbBlurb or her personal Instagram account @lorrainedallmeier.